The Bachelor star Colton Underwood and his pal Jason Tartick are apparently making their girlfriends, Cassie Randolph and Kaitlyn Bristowe, respectively, fast friends! 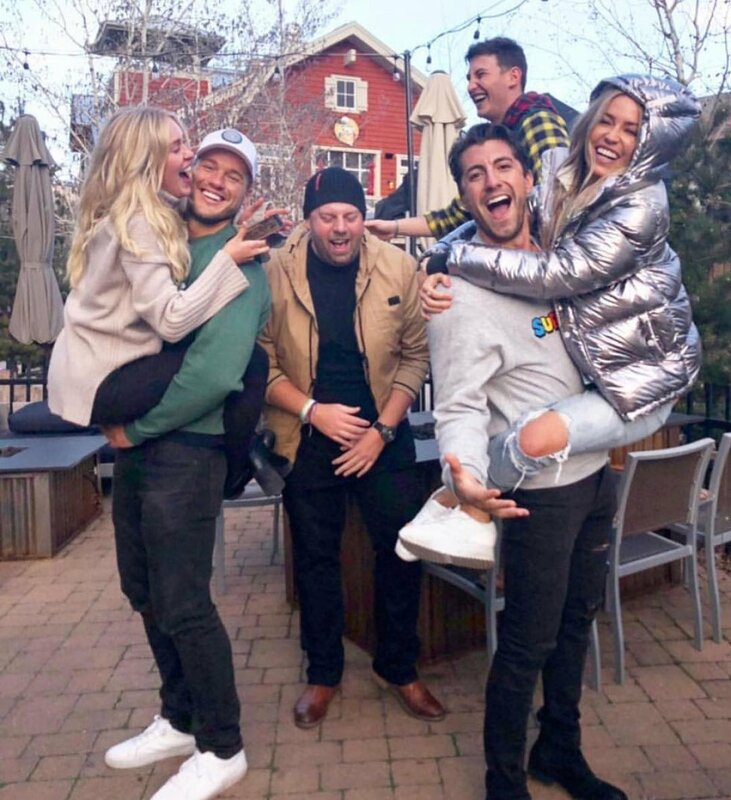 Colton, Cassie, Kaitlyn and Jason united on Saturday to record an episode of Kaitlyn's "Off the Vine" podcast, according to Us Weekly, and they also enjoyed a double date in Aspen, CO. The four individuals each wrote about the fun gathering, which also included Blake Horstmann, on Instagram. "And to think just over a year ago none of us knew each other..." Jason, 30, captioned a photo in which Kaitlyn and Cassie each had her legs wrapped around her man's waist with Blake laughing in the background. Kaitlyn, 33, shared a photo of Cassie and herself, writing, "Why is, 'I'd jump a fence for her too,' the only caption coming to me." Kaitlyn was clearly referring to how Colton jumped a six-foot tall fence and attempted to quit The Bachelor after Cassie dumped him and threatened to leave the show. (Colton later convinced Cassie to stay and continue dating him). "We get it," Kaitlyn continued. "Colton jumped a fenceâ€¦. But in all seriousness I would. She's the sweetest." As for Cassie, the 23-year-old assistant speech pathologist posted a group photo on Instagram and wrote alongside it, "Love this group of people... can we do this all over again?" And finally, Colton, 27, captioned a photo with his boys, "What a weekend," followed by a group shot of them supporting his Legacy Foundation at a charity event for children with cystic fibrosis. In addition, Kaitlyn posted a selfie she took with Cassie and Colton on social media. "Little sweetie nuggets," the podcast host and Season 11 The Bachelorette star wrote. "We love your love." The reality TV stars were all bundled up in warm sweaters and coats for the Colorado weather. Colton, Blake and Jason all competed for Becca Kufrin's heart on The Bachelorette's fourteenth season last year. Colton and Cassie went public with their romance in March on the finale of The Bachelor's 23rd edition. Kaitlyn and Jason confirmed their relationship in January 2019, just two months after she and her ex-fiance, Shawn Booth from The Bachelorette, broke off their engagement after three years together. Although Blake is apparently single, fans are hoping he'll look for love on this summer's edition of Bachelor in Paradise after finishing as Becca's runner-up. Hannah Godwin, who came close to winning Colton's heart on The Bachelor, recently admitted she has her eye on Blake and would be open to appearing on Bachelor in Paradise. 'The Bachelor' star Colton Underwood: I plan to propose to Cassie Randolph "within the next year"